Star Citizen's FPS module is called "Star Marine"
We can now stop referring to Star Citizen's FPS module as "the Star Citizen FPS module," and instead call it by its proper name: "Star Marine." Star Citizen mastermind Chris Roberts revealed the name in a major update in which he explained that the launch of the shooting bits will be handled differently than the launch of the flying bits. "Where Star Marine differs from Arena Commander is that we’re not launching it in its most basic game. Instead, we’re trying for something more," he wrote. "It includes animation fidelity and attention to detail that you wouldn’t normally expect in an 'alpha' gameplay module. There’s even an entire sci-fi sports game with zero-G movement fully simulated and animated in there! (And don’t worry, there’s traditional FPS action too… with some new ideas that aim to set Star Citizen apart from the crowd.)" The Star Marine page is impressively well-packed with information on character customization, different visual styles, videos of motion capture sessions and animations, and SATA Ball, the sci-fi sport Roberts mentioned, which sounds like a zero-G version of Unreal Tournament's Bombing Run. 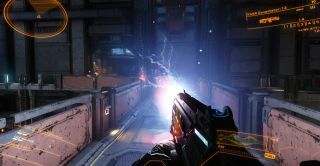 It's a non-lethal game, although it does involve some gunplay; the intent is to use it as a "test bed to make the zero-g locomotion system something very robust, and ultimately a viable movement strategy when you are in that [zero-G] environment." There's no word on when Star Marine will be ready for public eyes, but Roberts said Cloud Imperium will continue to provide regular updates until the first public release is ready. "Trust us when we say, we are as eager as you are to kick off playtesting and let the Star Citizen community see what we’ve been putting our all into," he wrote. "Star Marine is an important building block to the complete Star Citizen experience, it’s a showcase for how far we’ve come with many of our technologies and processes… and it’s going to be a lot of fun, too!"